In a hot pan cook vegan bacon until crispy. Set aside. Sprinkle Beyond Burgers with salt and pepper and grill or griddle burgers for 2-3 minutes on each side, place vegan cheese on patty as soon as you flip the patty. Meanwhile grill pineapple rings for grill marks around 2 minutes each. In a hot pan place red onion and sweat onions until they because translucent then add 2 T of the pineapple juice reserved to allow the onions to caramelize for 3-4 minutes on medium heat. Toast buns. 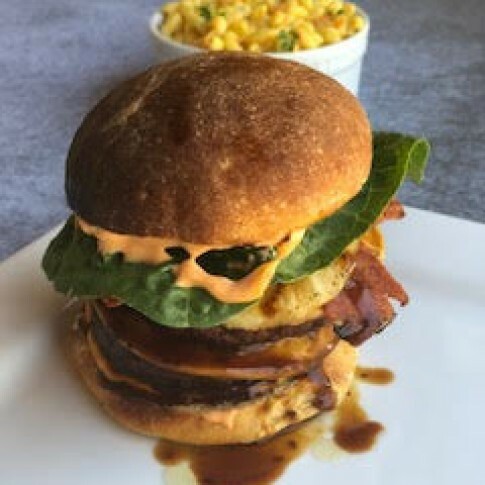 Place sriracha aioli on each side of bun, place burger patty down, drizzle patties with teriyaki sauce then place bacon, grilled pineapple, onions and lettuce leaf, love the top bun on and enjoy your Hawaiian style burger. Add soy sauce ginger, garlic, brown sugar, pineapple and it’s juice and water. Bring to a simmer. Reduce heat add cornstarch slurry and whisk until it thickens. Turn off heat and allow to slightly cool.